Tim is founder and owner/operator of Precision Fitness, Inc. He has personally been involved with exercise for 40 years and currently has over 33 years of professional work experience in the health and fitness field. Prior to starting Precision Fitness, Tim worked in a variety of settings and capacities ranging from fitness instructor/personal trainer in a Nautilus fitness center, to Fitness Director of a large, multipurpose medically based health and wellness center. Tim earned a Bachelor of Science degree in exercise from Northern Illinois University. He has earned a number of nationally recognized fitness and personal training certifications over the years including: Health/Fitness Instructor with the American College of Sports Medicine (ACSM); Personal Trainer with the American Council on Exercise (ACE); MedX Exercise Technician with the University of Florida, Center for Exercise Science; and Master SuperSlow Instructor with the SuperSlow Exercise Guild (SSEG). 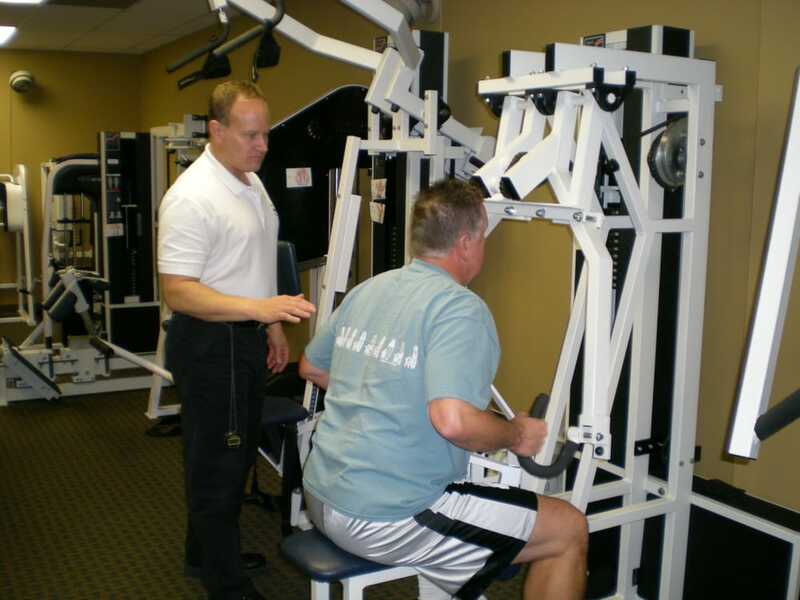 Tim also has extensive experience in rebuilding, refurbishing, and designing and installing custom modifications and retrofits on exercise machines such as Nautilus and MedX. High-intensity Training at home, using free weights – is it possible? Should you do it? How do you optimise muscle gain? Let me know in the comments below. Another great podcast/interview. A sin that Kieser closed in London . But (if somehow possible) one will find a solution. In fact, I work for Kieser in Germany as a therapist and instructor. One client from London visits us now once every 5 weeks to be instructed by me. Although he now lives in Brussel, Belgium he told me he would even make the trip from London for a workout. So much he needs it. He travels for a few hours to get a 30 minutes workout!! Truth is he wouldn’t be able to workout by himself as you can. Nevertheless in think it would be a good idea for you to search for a good equipted facility to workout with an instructor one in a while. Even if only to control your ‘Benchmark’. But having said this, why not start small your own facility!! I did so and work as a PT and nutrition advisor besides the work at Kieser and another public facility. Many hours a week, but a get a good idea of working on 3 sides of the busines. Thank you Ad. I have more to come! I have thought about starting a gym business – maybe in the future. That’s insane what you said about that client that would be willing to travel so far for a instructed HIT workout – I can believe it! Do you know of any places in London with HIT instructors/high quality equipped gyms besides Physical Culture? Yes that’s indeed insane. I will see if I can find out about a place in London. Maybe listeners out of London will react. What about James Steele? Maybe he knows. See Dennis reacted too. Best wishes Dennis, hope your well. Physical Culture Gym (Medx/Nautilus, but not 1to1 in quit environment). Great interview! Tim Ryan definitely deserves a place near the top of the list of HIT trainers. His professionalism and expertise are unrivaled in the industry. His commitment to the truth is refreshing, in a way that makes me proud to be a part of it. Thanks for all you are doing for this important work. Thank you Dennis for your kind words. It was a joy to chat with Tim. I would love to be trained by him 1-on-1. One day, I’m hoping to do a tour of some of my guests facilities. Cheers Fernando. Huge fan of Steve and his work. I will take a gander. I find it interesting that hit oriented people tend to always talk about conventional training dogma and yet they never seem to check their own dogma . Such as the magical 45 – 90 seconds of time under tension to maximize muscle and strength gains and the full body workouts 2 or 3 times per week . I don’t think there is any evidence to support a certain time under load to maximize muscle mass and strength gains although there probably is a point at which you can go to far with TUT . Effort is most likely the primary determinate as far as results attained from training . It seems quite odd to me that Tim would think that 3 exercises performed every 2 weeks is extreme . We tend to forget our own experiences with regard to time off between workouts and forced layoffs for whatever reason . We’ve all had the experience of taking 2 weeks or more off from the gym and coming back stronger and noticing a muscle mass increase in the arms for example . I think there is a type of paranoia about losing muscle and strength that really isn’t well founded at all . By the way if your looking for a great leg exercise at home it’s the split squat ! Don’t lock out at the top and you can vary the pace like 2 seconds up 4 seconds down for example . Also for stability sake and safety hold a wall or door knob but let your thighs do the work and when you fail just pull yourself up . Body weight is more than enough with this one but if your advanced you can hold a dumbbell . You may also want to elevate your foot on a block maybe 3 inches or so of the floor to help protect the knee . A very nice leg option for home or gym training . Really hammers the glutes and quads along with very good hamstring stimulation . Hi Enlite – I agree, a high-degree of effort and reaching failure for maximum recruitment seem to be the only things that really matter. My understanding is that 45 seconds minimum was just a good benchmark to ensure that one recruits as many muscle fibres as possible during the set. Personally, I have found that, with my lifestyle (activities, stress, work, etc), that even 2 high-intensity workouts a week can be too much and leave me feeling like crap. If my lifestyle were to change then I reckon I could progress with more volume. Thank you for the tip regarding the split squat! I saw that Bill DeSimone provides some good demos for form on his YouTube channel. I will need to give it a go. Currently I’m doing wall-sits with dumbbells followed by SuperSlow body-weight squats. I often find that reaching failure like I have on machines is so challenging with body weight. It takes real discipline and practice. I’m interviewing Skyler Tanner again tonight so will explore this further with him. Hey Ad, so sorry, but the above post that you struggled to get through was stopped because it had a link! It was sitting in a pending list for 9 months! Won’t happen again. Thanks for posting. Hey, just listened to this one. If you still want to do more ham work with regards to knee flexion then check out some home made glute ham raise equipment online. Ross Enamite has featured some on his blog and I’ve seen some other super easy minimalist stuff floating around. I also get pretty good fatigue from using resistance bands for leg flexion, sandbags are really useful too when working out at home. As for rhomboids etc I do a range of scapular retraction exercises from home (hanging, plank based etc) also a little rotator cuff work too.